A list of 102 interesting objects that you helped pick for follow up (let us call them Disk Detective Objects of Interest, or DDOIs) shows that many of the stars with disks we locate will be A dwarfs or K giant stars. 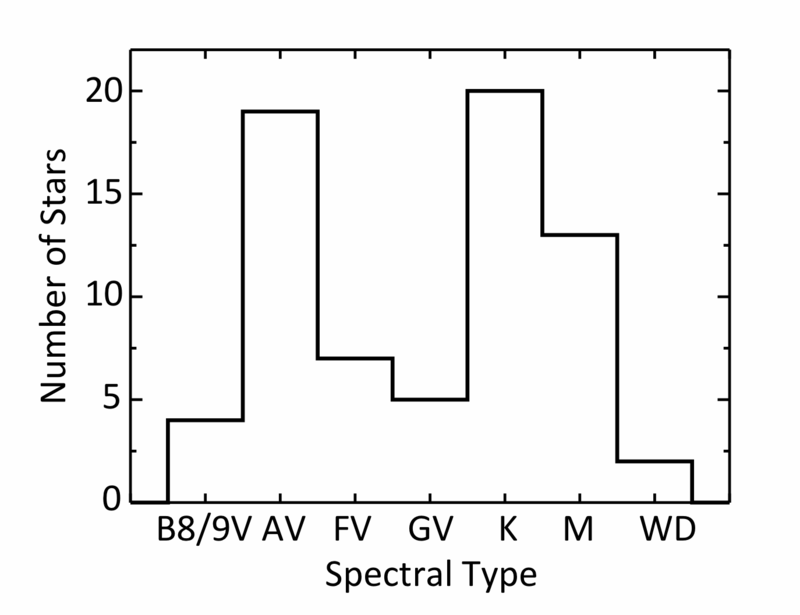 We don’t yet know all the spectral types of the DDOI stars precisely, but you can see the distribution of the types we do know in the figure below. The peaks correspond to A dwarfs and K giants. Distribution of DDOIs according to spectral type. The two peaks at AV and K show that most stars hosting disks in our list are stars of type A and K that are about twice as massive as our Sun. So what are A dwarfs and K giants? “A” dwarfs are very hot, fast spinning and blue stars that are younger and brighter than “G” stars such as our Sun. The bright stars Sirius and Vega are some well known A dwarfs. 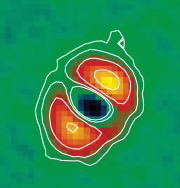 Many of the best studied debris disks are around A dwarfs. What are these “K giants”? K giants and A dwarfs are two sides of the same coin. Let’s talk a bit about the life cycle of a typical star. K giants are former A stars that have evolved for hundreds of millions of years. Like the sun, they have burned through their hydrogen, and ballooned up in size. 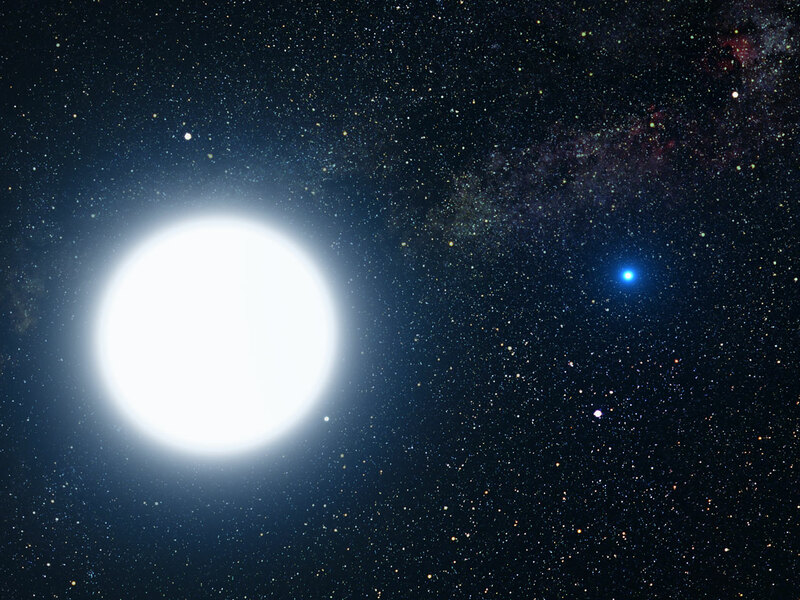 Both A and K stars are about twice as massive as our Sun. K giants are also really interesting because Jupiter-sized exoplanets orbiting these old, giant stars have been found to be more common than Jupiter-sized exoplanets orbiting less massive stars that are still on the main sequence. These exoplanets around K giants have been found by the popular radial velocity (Doppler shift) method. Also, some of these K giants have debris disks, sometimes even dustier than their younger counterparts. This is surprising, because giants are very bright and light from the star exerts radiation pressure on small dust particles that ought to blow the dust away, or cause them to slow down and spiral into the star and be swallowed up. So where is the dust around these K giants coming from? Nobody really knows yet, but there are several hypotheses. One is that dust is coming from the star itself. Another is that the dust is in fact interstellar dust in our galaxy. A third is that giants are breaking up more comets. Whatever the cause, we have a lot of K giants in our list of DDOIs that potentially have dusty disks–so once we can follow these up with telescopes we will be able to help solve this mystery. Dawoon Jung (@dirkpitt2050) is a graduate student at the International Space University currently at NASA Goddard Space Flight Center doing a summer internship with the Disk Detective team. He was born in Korea, and is interested in exoplanets and space flight. ​Herschel image of κ Coronae Borealis 31.1 parsecs away. This K giant is about twice as massive as our Sun. The red regions correspond to dust orbiting the star. Interestingly, this star also hosts at least one exoplanet with a mass of about 2 Jupiters. Credit: Bonsor et al. 2013. The question is: is it possible to image a planet around K-giant directly or are the planets too cool for that to happen?